A city that has something for everyone, from the beautiful beaches and cultural attractions to the art galleries, literary landmarks and mouth watering food, Barcelona is a city best explored at your own pace. Best known for the distinctive, colourful creations of Antoni Gaudi, eye catching modernista architecture defines a city that begs to be discovered on foot. Punctuate your day with a leisurely lunch of paella or take tapas and people watch from one of the numerous bars along Las Ramblas. We’ve put together our top recommendations for drinking, dining and sleeping in this colourful Catalonian city. 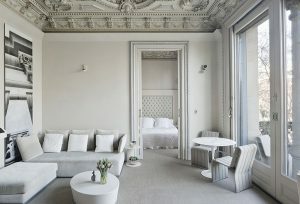 We love the privacy afforded by El Palauet which houses just six generous suites. Perfectly located on the popular Passeig de Gracia, this stunning art nouveau building boasts dramatic stained glass windows and fabulous frescoes in its designer clad interiors. White, minimalist, chic and with every conceivable mod con, each suite has its own personal assistant to help you enjoy the city like a local. Enjoy sundowners at the rooftop bar or relax weary limbs in the spa which is available exclusively for guests. There’s a Finnish sauna, jacuzzi, massage suite and a chill out terrace area from where you can escape the busy streets below. 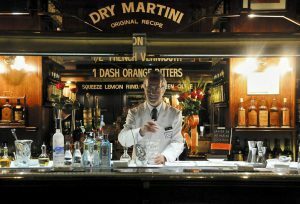 Celebrating its 40th anniversary this year, Dry Martini exudes a classic old world charm with dapper looking bartenders and classic leather banquettes. If you’re wondering what to drink, then the clue really is in the name here – they’ve just celebrated mixing their millionth martini – no mean feat! Classy and unpretentious, there’s a grown up atmosphere that’s sophisticated but not stuffy. The perfect place to start your evening or equally, to end it – they’re mixing and shaking until 3am most nights. 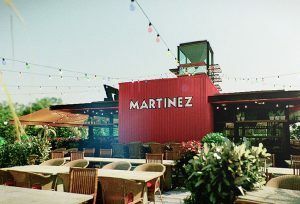 Leave the hustle and bustle of city life and escape to Martinez for a leisurely lunch or dinner. Located halfway up a mountain with spectacular views of the port and sea from the deck, this place serves moreish tapas and paella that justifies the journey (which you can make by cable car if you’re looking for a really memorable experience). The tipple of choice is a fine Vermouth or a glass (jug?) of traditional sangria to wash down the fabulous dishes. Service is attentive but relaxed and there’s a friendly vibe throughout. Open for service daily from 1pm, last booking at 11pm. Booking is recommended.